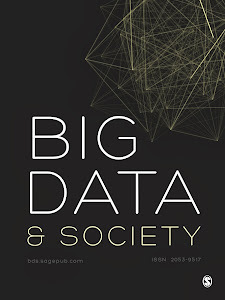 The SAGE open access journal Big Data & Society (BD&S) is soliciting proposals for a Special Theme to be published in early 2019. BD&S is a peer-reviewed, interdisciplinary, scholarly journal that publishes research about the emerging field of Big Data practices and how they are reconfiguring academic, social, industry, business and government relations, expertise, methods, concepts and knowledge. BD&S moves beyond usual notions of Big Data and treats it as an emerging field of practices that is not defined by but generative of (sometimes) novel data qualities such as high volume and granularity and complex analytics such as data linking and mining. It thus attends to digital content generated through online and offline practices in social, commercial, scientific, and government domains. This includes, for instance, content generated on the Internet through social media and search engines but also that which is generated in closed networks (commercial or government transactions) and open networks such as digital archives, open government and crowd-sourced data. Critically, rather than settling on a definition the Journal makes this an object of interdisciplinary inquiries and debates explored through studies of a variety of topics and themes. Past special themes for the journal have included: Knowledge Production, Algorithms in Culture, Data Politics, Data Associations in Global Law and Policy, The Cloud, the Crowd, and the City, Veillance and Transparency, Environmental Data, Spatial Big Data, Critical Data Studies, Social Media & Society, Assumptions of Sociality and Data & Agency. See http://journals.sagepub.com/page/bds/collections/index for more information. An overview of the proposed theme, how it relates to existing research and the aims and scope of the Journal, and the ways it seeks to expand critical scholarly research on Big Data. A list of titles, abstracts, authors and brief biographies. For each, the type of submission (ORA, Commentary) should also be indicated. If the proposal is the result of a workshop or conference that should also be indicated. Short Bios of the Guest Editors including affiliations and previous work in the field of Big Data studies. Links to homepages, Google Scholar profiles or CVs are welcome, although we don’t require CV submissions. A proposed timing for submission to Manuscript Central. Information on the types of submissions published by the Journal and other guidelines is available at https://us.sagepub.com/en-us/nam/journal/big-data-society#submission-guidelines. Please submit proposals by Tuesday July 3, 2018 to the Managing Editor of the Journal, Prof. Matthew Zook at zook@uky.edu. The Editorial Team of BD&S will review proposals and make a decision by mid- to late-July 2018. For further information or discuss potential themes please contact Matthew Zook at zook@uky.edu.